A model showing the expanse of DWC. Work has begun on the second phase of the Al Maktoum International Airport (AMIA), which will significantly boost the passenger and cargo capacity at the Dubai World Central (DWC) aerotropolis under a $32-billion expansion. The airport, when fully operational, will have five runways, and is projected to move 200 million passengers annually – in effect tripling Dubai’s current level of passenger traffic – and 16 million tonnes of cargo. The expansion project will span six to eight years. DWC is currently one of the largest urban development projects in the UAE. Almost twice the size of the island of Hong Kong, it covers an area of about 145 sq km. Ultimately, it will represent a significant engine for Dubai’s economic growth, with trade and business activity between AMIA and Jebel Ali port expected to capture 65 per cent of Dubai’s GDP (gross domestic product). “It will not only provide an attractive community setting for families of professionals who work at DWC but also for the thousands of people who commute between Sharjah, Dubai and Abu Dhabi on a daily basis,” he adds. DWC was conceptualised and launched in 2006 as a strategic initiative of the Government of Dubai and is aligned to the Dubai Plan 2021. Beyond having at its heart the world’s largest airport when complete, the masterplanned full-fledged city is capable of hosting a diversified base of businesses, generating thousands of jobs, and ultimately supporting a population of one million people. From a masterplan perspective, the project is represented by eight designated districts including Aviation, Logistics, Residential, Commercial, Golf, Humanitarian City, the Exhibition District – which will host the Expo 2020 – and the AMIA itself. 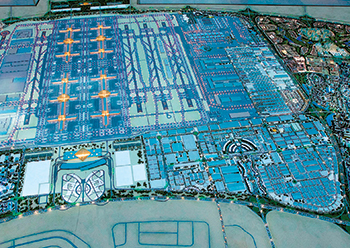 The DWC masterplan showing the districts and the airport. DWC is responsible for the overall masterplan of the project. “Work is being done in several phases starting with the development of the necessary infrastructure and facilities to support the airport and the businesses reliant on airport activity,” says Bu Qara’a. The initial key components of DWC have, therefore, been the Logistics District, the Aviation District and the Business Park Free Zone. This involved creating the right infrastructure and products in order to attract key industry players to come and operate out of these areas, thus establishing an industry-based and knowledge-based ecosystem which ultimately generates jobs. He further says: “The community facets of DWC – the development of the residential, commercial and golf – areas are also in progress. We have begun projects in the hospitality sector and signed several agreements with industry players. An agreement between InterContinental Hotels Group (IHG) and Abjar Hotels International, for instance, will see a 450-room Holiday Inn and 250-room Staybridge Suites built at DWC by the first quarter of 2018. Dubai Airports – which owns and manages the operation and development of both of Dubai’s airports – recently announced that annual passenger traffic through Dubai is expected to exceed 126 million by 2020 and reach around 200 million passengers by 2030. He points out that significant progress has been made at the airport development. “The first runway at AMIA was completed in 2007 and in June 2010 it opened to cargo flights for the first time. Our partner Emirates Sky Cargo now operates at DWC from its own dedicated terminal building. The landing of the first passenger flight at AMIA in October 2013 was also historic. Meanwhile, Leslie Jones Architecture has been commissioned by Dubai Airports to support the commercial design strategy for AMIA, in a move to ensure that premium space is effectively planned, and successful airport businesses will be ideally positioned to engage with high volumes of global travellers. 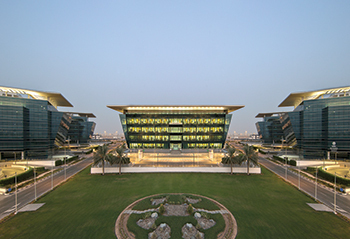 Business Park District at DWC. Two of the eight DWC districts – Airport, Aviation and Logistics – are linked in a special way to the airport. The Aviation District has been developed to meet the comprehensive needs of the industry, from design and development to the operation and use of aircraft. It caters to the practical requirements of maintenance, repair and overhaul (MRO), fixed base operators (FBOs), light industries, research and development (R&D) and educational facilities. 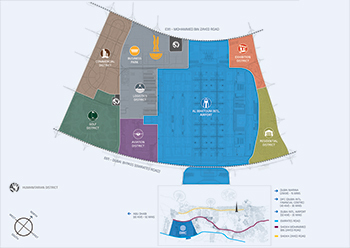 The 6.7-sq-km district sits adjacent to the AMIA and provides seamless connectivity between landside and airside. This location is also ideal to support the one million airplane movements that the new airport will ultimately see, Bu Qara’a points out. In November last year, a Completion Centre operated by Falcon Aviation – the first of its kind in the region – broke ground within the district. The $80-million facility is spread across 13,705 sq m and is expected to be completed by the end of this year. It will provide enhanced and customised services to VIP customers and will also feature a state-of-the-art hangar equipped to accommodate up an Airbus A380. “In the same month, we signed an agreement with France-based STTS Group – a major player in aircraft painting – which will build a multi-purpose facility to service various aircraft,” he says. A key feature of the Aviation District is its Executive Jet Terminal – announced in December 2014 – that caters exclusively to business aviation. The 6,000-sq-m facility is scheduled for completion in Q4 of 2015 and will host Jet Aviation, XJet, and Jetex as key FBOs. The district also has demarcated zones for educational and R&D institutions, creating a ‘cluster effect’ for stakeholders. The Emirates Training Academy is expected to break ground on its educational facility at the district this year. In addition, the Aviation District is the new, permanent home to the biennial Dubai Airshow as well as the Middle East Business Aviation (MEBA) exhibition. The Logistics District is a multimodal platform dedicated to companies from diverse segments of the logistics sector. The 21-sq-km area is designed to be an enabler of fast-cycle businesses, and of value-added services such as light manufacturing and assembly. The district is seamlessly connected to Jebel Ali Port via the Dubai Logistics Corridor. The single-custom bonded area brings key advantages to logistics companies in terms of ease, cost and time effectiveness, offering unhindered connectivity for sea-to-air and air-to-sea cargo. Its portfolio of offering includes ready-to-occupy or built-to-suit office spaces, warehouses and distribution centres. “With features such as optimised territorial layout, modern infrastructure and the ability to tailor solutions based on customer requirements, the Logistics District seeks to support businesses looking to strengthen their footprint in the region. “We have partners such as DHL, Aramex, RSA Logistics, Kuehne + Nagel, Ikea Group, Mohebi Logistics, Panalpina, Landmark Group, to name a few,” he says. DWC is designed to facilitate the needs of organisations at various stages in their journey. “We have drawn up several solutions that cater to the specific needs of start-ups and SMEs, whether in terms of business registration processes, set up or operational costs. We are providing them with ready-to-use and built-to-suit offices and facilities across our Business Park Free Zone and Logistics and Aviation Districts. In fact, earlier this year the Aviation District announced a Dh120-million ($32.67 million) multi-purpose building for small and medium enterprises (SMEs) in the global MRO sector,” he says. The Residential District is progressively developing an urban community which places the needs of individuals and their families at its heart. The 6.6-sq-km district will offer a balanced mix of properties and host a well-organised, attractive community environment with all supporting utilities and infrastructure. This includes nurseries and schools, clinics and hospitals, recreational parks and children’s playgrounds, cycling tracks, retail facilities, and the ‘Green Belt’, the largest privately developed park in Dubai. “All our efforts are aligned with Dubai Plan 2021 as we seek to develop DWC into a preferred destination to live and work,” Bu Qara’a concludes.